I recently had the opportunity to test out Precisio Slant Tip Tweezers by Crave Naturals. I personally use tweezers in my weekly arsenal for touch ups between visits to my eyebrow lady. I'm very specific in my expectations. They need to have a tight grip and pull out the intended hair. I was completely pleased with this product. They gripped great and worked perfect. These tweezers are solid in build and will last a long time. 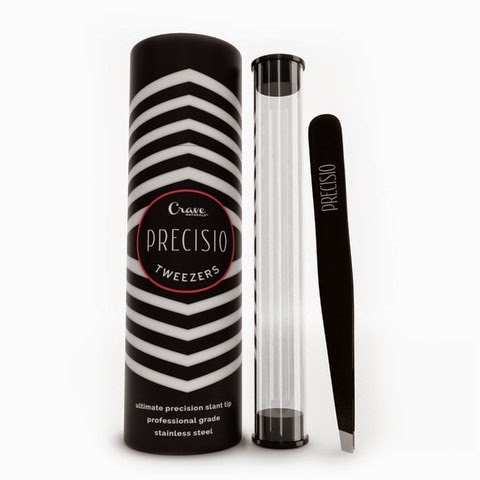 Precisio slanted tip tweezers are a must have for your makeup bag. Designed with a precise slanted tip, you will be able to get so close to the root of hairs so there is less pain in hair removal and no more ingrown hairs. Hair removal will be simple and pain free. Each tweezer is hand filed and perfectly aligned to give you the professional results you are looking for. Guaranteed to stay sharp for life, Precisio tweezers do not require resharpening, nor replacement. You can purchase your Precisio Slant Tip Tweezers on amazon or at icravenaturals.com.